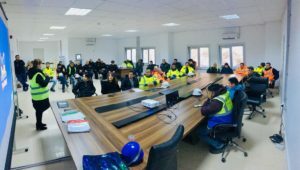 On March 4 a Fire Safety Training was conducted at Shuakhevi HPP which consisted of theoretical as well as practical parts. Representatives of the Company Ltd “Fire Safety and Service” provided information to operational team as well as camp security personnel on topics such as management of emergency situations, evacuation of personnel during fire, classification of fire and fire extinguishers, also hydropower ventilation and fire safety systems. During practical training a fire was extinguished by different type fire extinguishers (powder, carbon dioxide, foam type), apart from it principles and rules of usage of fire hydrants were shown.